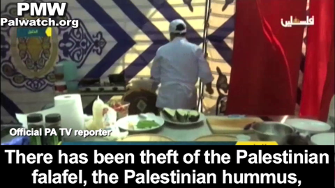 Official PA TV reporter: "We are talking about a brutal attack against the Palestinian heritage in general, including Palestinian foods. 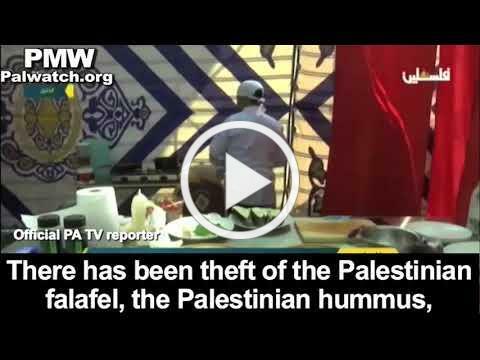 There has been theft of the Palestinian falafel, the Palestinian hummus, and some popular foods by the occupation. 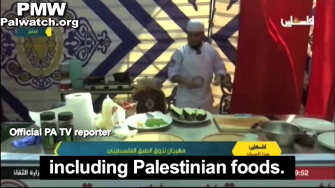 Holding [food] festivals like these is essential in order to preserve the heritage and also the Palestinian foods." This particular accusation is part of the overall PA lie that there is no Jewish history anywhere in the Land of Israel in general and in Jerusalem in particular. The PA falsely claims that everything in the land testifies to a "Palestinian history," and to justify this goes to great lengths to falsify such a Palestinian history. The accusation that Israel has "stolen" the falafel and the hummus, which is Middle Eastern in its origin, is part of the PA's denial of the existence of anything that can be associated with Jewish or Israeli history, and at the same time presenting everything as part of "Palestinian history." Palestinian Media Watch has documented this and similar accusations numerous times. While denying the authenticity of a clay impression of the royal seal of King Hezekiah of Judah (727-698 BCE) found in 2015 at the foot of the southern wall of the Temple Mount, Fatah Central Committee member Muhammad Shtayyeh added that Israel also "fabricated the falafel." 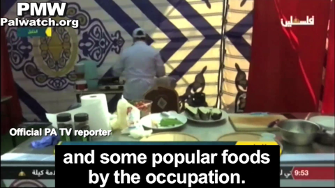 A PA Parliament member also complained that Israel has "falsified [the origin of] the falafel ball," and a columnist in the official PA daily wrote that Israel has "stolen our clothing, our keffiyeh, our falafel, and our hummus."